I use PDF995, it works pretty well, I've had a licensed copy for a while now. Batch rename, batch name pre or suffix, resize, shrink photos etc. Well, it needs to be installed as a PDF printer doesn't it? There are some other components avaiable that are part of the 995 suite and that are standalone and some integrate. Remus - I added Objectdock and like it quite a bit. Thank you! A really simple iso mounting tool. Just install and your off. Also gives you the option to mount CD/DVD images through a right click. 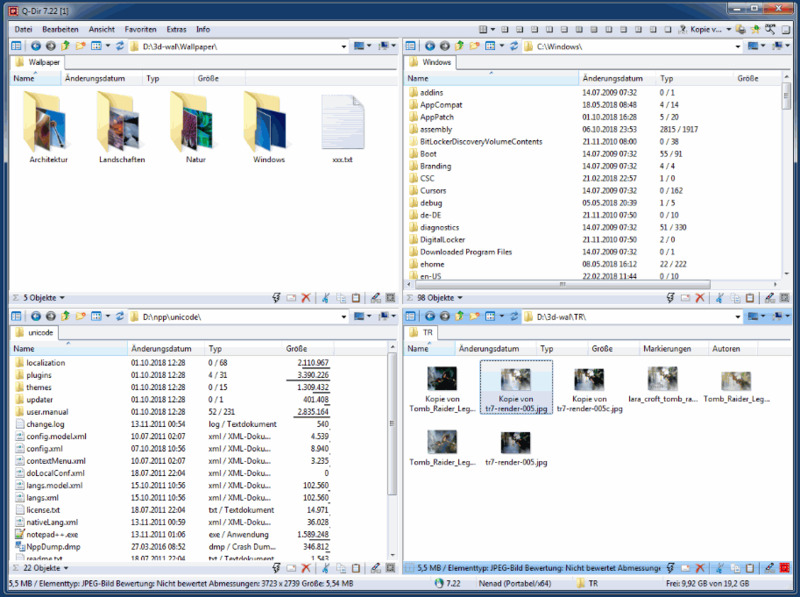 Replaces your native windows explorer with dual pane action goodness. Its got a free version. I refuse to work without this app. Cool tree app! Where do I find .X importer for Sketchup? I know of a DirectX exporter for SU, but not an importer. IIRC you'll have to use some other conversion app and import that. Not an application as such, but a really useful (and free) webpage for collecting your RSS feeds together. The usual easy to use google type layout. A microsoft application that works (so far.) Basically its a syncing application, you select the 2 folders you want to sync, press go and they sync. Very useful for backups and synchronising laptops etc. Also has lots of useful options and very few superfolous options, im pretty impressed with it so far. A highly recomended method for encrypting your data. Free as well. Q-dir is my pick of the year. Standalone(yes, it's portable), free, small (<500kb), fast. A true alternative to the win-explorer it has 4 explorer windows including quicklinks and favorites for dispositions. Give it a try! It's free and no need to install it. A true usb-stick friend ! Last edited by marne on Sun Aug 31, 2008 8:29 pm, edited 1 time in total. Basically a super enhancement to firefox, lets you do loads of really sweet things. Check out the link for much more in depth stuff. note: i havent actually tried this yet, theres might be soemthing im missing here so keep your eyes open. Hopefully this doesnt sound too offensive, but have you actually looked at the link? its a really good app. p.s. It runs on windows as well, so in my book that makes it a ueful win app. Well i have tried it now, and it is pretty good. A bit rough around the edges, but very good none the less. I havent kept track of it, but after reading through their blog quickly it looks as if the development team is pretty active. Always a bonus. A tiny program that allows you to resize windows to exact sizes. I find it helpful when making screen captures to resize the application before recording. Not a fan of Synctoy, I use allwaysync. I've downloaded the Jing Project (free) for the Mac also registered with ScreenCast, free for 60 days. There is also a Win version of Jing. I can highly recommend this set up for communication. Thank for the Jing Project, Mike!!!!!! Pixero wrote: Microsofts directx file format, for game engines and such. The great thing with three[d] is that it exports animated trees that looks like the wind is blowing. I've done some tests with it and DX Studio and exported buildings from SketchUp. Nothing to show yet though. so is there a way of opening these files in sketchup? as all i can seem to do is export the sketchup to .x and not the otherway round. Well enough people have used it and said they like it for me to be able to recommend it here. Its party piece is running each tab as a separate process. Essentially this means that if one tab messes up its jsut that tab that goes down, rather than the whole browser. (so I, ME, Myself,is sinning, same as Remus, for i have not yet proved its use and recommended it. Kind of like lightroom, but free. A rather pleasing app overall.